Anyways, this is hardly a surprise. Google, like Facebook, use their enormous market dominance to squash any competition, and regularly advertise their own products ahead of the competition. When the company itself is clearly guilty of biasing search results in its own self-interest, its not surprising its employees' join in the fun. I don't know, you don't piss off a cop. You don't piss off a lawyer. You don't piss off your barber while she's cutting your hair. 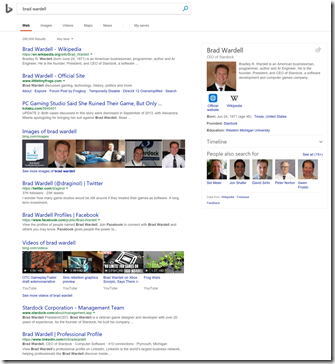 You don't piss off Google when they control the SEO and your gmail account. Yeah, it's wrong, but in your own self-interest, it's good just not to piss people off. And I'm preaching to myself here. The far-reaching ramifications of Google's omniscience is, of course, another known topic of discussion. I think someone did a movie about it? Had Tom Hanks and Emma Watson? Ya know, I have noticed frequently in the past that the "douchebag" article was always in the top of Google searches but ignored although was curious why it was ranked high and simply figured people kept linking to it. 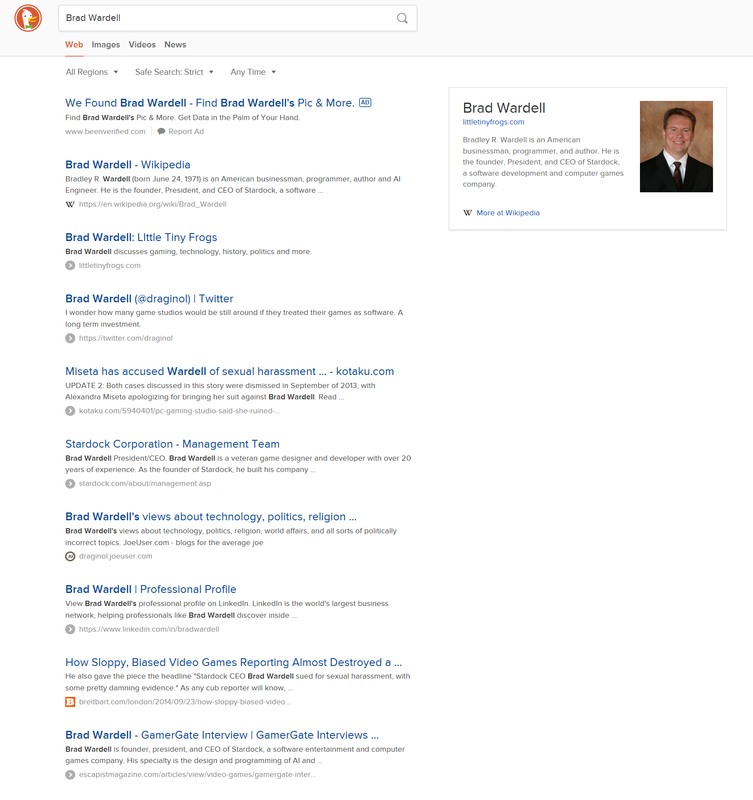 As for why I would be googling "Brad Wardell" frequently, well don't judge me (ie fanboy, etc) but every once in awhile I do it to see if I missed any articles, interviews etc that I might have missed. I had never even spoken to this person before. I had no online debate with him. You are, in essence, suggesting that we simply cede all communication to the whims of random Google employees who might be observing. Do I have a choice, though? I can't stop Google from doing what they do. I know Google was seed funded by the CIA. Google isn't all bad, nor all good. But they are big, and tealeaves are small. If I thought there was a battle that I had any chance of winning, I would reconsider. I realize that is a bit of a defeatist attitude, but I think realistic--this time. I work for a company that has an employee code of ethics, that every employee has to verify yearly that they have read and understood. 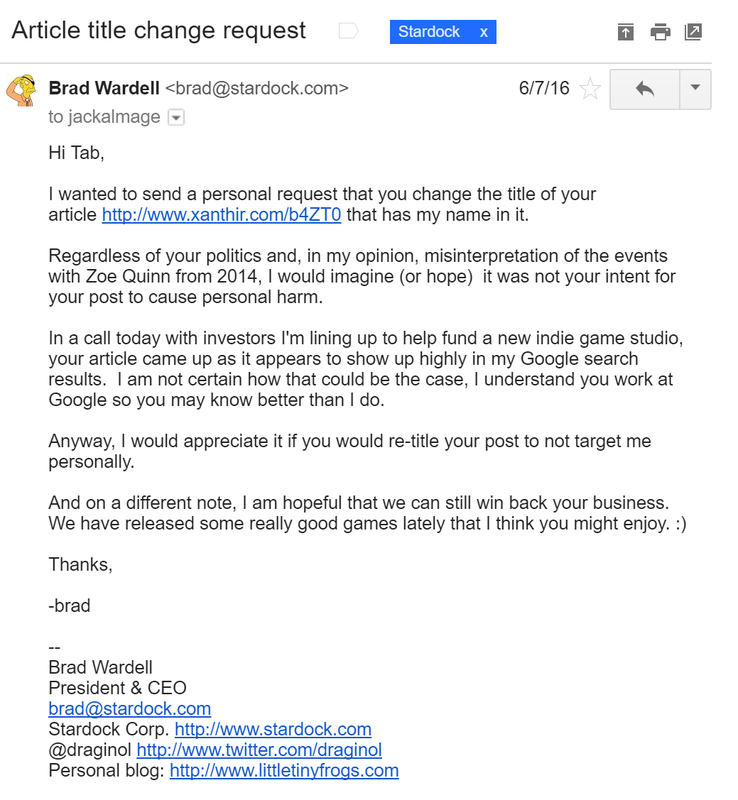 If Atkins really has manipulated Google search to promote his own blog, in my company that would be a violation of the terms of employment and would be grounds for immediate dismissal. There is no way to know for sure. I do think the evidence speaks for itself. It could be he’s using a bot net to simulate clicks for instance. In in terms of a code of ethics, if we had an employee that was making public announcements about private citizens (as opposed to say a politician) we’d take a pretty dim view of that. To me, Tab’s behavior says a lot about the internal culture of Google and that they will pretty brazenly use their insider knowledge to mete out Social Justice to those they think have committed some ideological wrong think. In my case, it’s just annoying (I’m not going to pretend it doesn’t irritate me). But imagine what they could do to someone with fewer means? My biggest fear is that the Internet, which was meant to liberate ideas and groups, has inadvertently created the tools to discretely control information and empower tribalism the likes of which we have never seen before. Between the influence of advertisers and governments, we have seen a great deal of erosion of free speech already. However, it is things like this where a single website or service can hold unprecedented power over what the world knows and thinks about an individual or a group that is starting to become ever more apparent. The only way that we are going to avoid falling victim to this kind of manipulation is by diversifying the internet again. Crowdsourcing, blockchains and decreasing hosting costs are key in enabling this but ultimately this is a struggle without end. Every generation has had to fight against authority of some type or other. This is just another generation of that struggle. I keep telling people that the real battle is always between an authoritarian and a libertarian mindset. There's a lot of assumptions here. 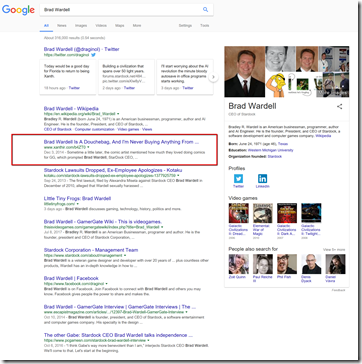 Have you ever considered that he simply knows how to get his blog listed highly because he knows the ins and outs of Google's SEO? Do you actually click his site when you search? This could create a bias if you only do this when using google search. People love scandals - so when they search your name and see something unexpected, they click it. It's like how youtubers use clickbaity titles, crazy pictures to get views. He could've verified his business with Google. Writers / bloggers linking to his blog often will make it more likely to show up for everything, not just your post. He could pay people per click - click farms with people going through each of his blog posts (or the ones he tells them to) and clicking them, or creating links to them on some other website(s). Gamers use Google more, so if they are searching and see something related to never buying anything from you again, they might click on it. Trolls - kinda like the pay per click item above, but more malicious. They help artificially inflate bad things about the people they don't like (if they're tech savvy, they can even automate it and use things like botnets). So, my point is that you are being awfully tin foil hatty here. There's far too many plausible explanations for why his blog shows up on Google earlier than it does on other sites. It looks like you're using Chrome in those screen shots, which is another Google affiliate, and he probably knows how to get high SEO on that too. I did a search for you using Firefox and Chrome, and the results were different. 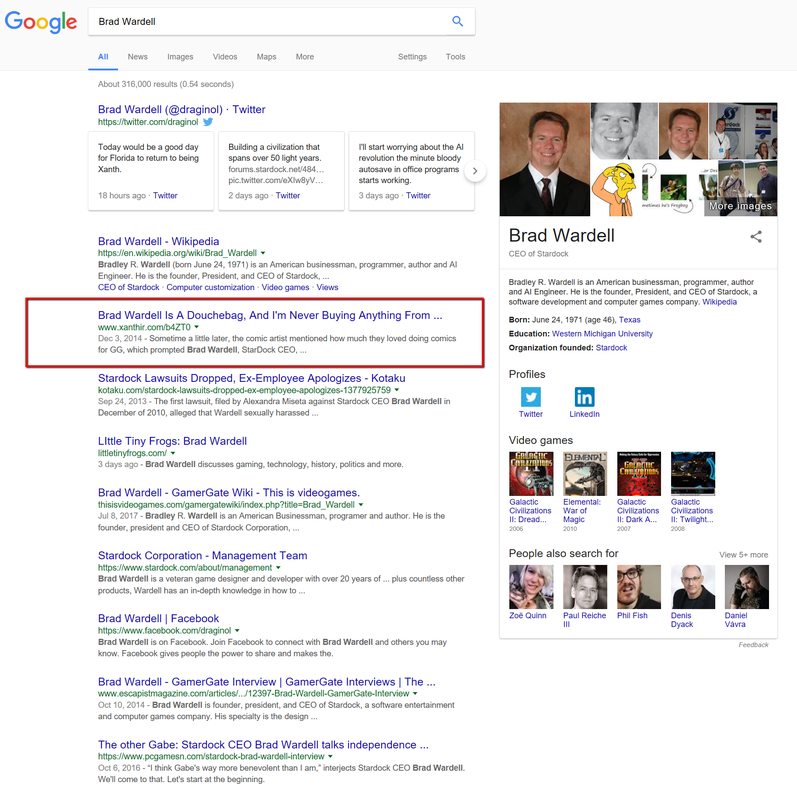 Also, while it wasn't on the first page, I did find his blog post fairly high up on the search results for other search engines when searching your name. Like I said, it's hard to go straight to a conspiracy when the difference 10-20 results, and only exists when it comes to things he would know a lot about (optimizing for Google searching and Chrome). Anyways, I think you will come to realize that you cannot convince people of things they do not want to believe. You can only change the minds of people who are open minded. That's why we still have flat Earthers (among countless other nonsense beliefs). Publically traded companies are required by Sarbanes Oxley regulations to have channels for reporting ethics matters. I know of more than one company, if you call their ethics hotline, you get their Legal department. That's right: their ethics hotline is answered by lawyers. So why only on google? Don't presume others haven't looked into this. I was using edge, not chrome in the screenshots btw. Arrogance is not a substitute for an argument. Abuse of position. Manipulating public perception to one's own end/s. The sort of thing that, say, Frogboy "could" do by deleting/banning hellknight55 for holding a conflicting opinion - but does not. There's been chatter for years about how they're doing the opposite as well, hiding things which are contrary to them. Of course it's been reinforced into a pseudo-myth with the various right-wing outlets popping up around Trump's claim that media is unfair. 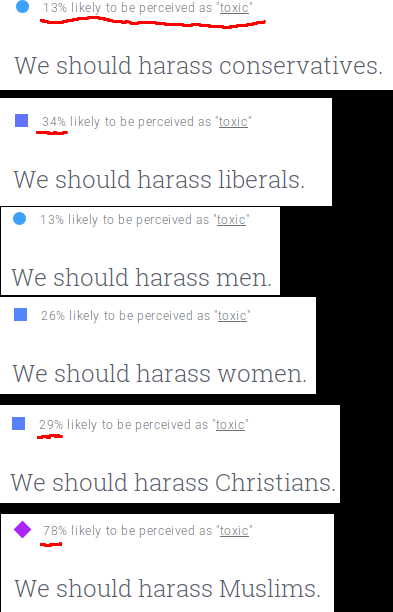 And then Google went and said "yeah, we do that" with Perspective: https://i.redd.it/vssva5dl3wez.png . Well, that was my other point, that I chose not to speak in my long post. Google is a private company that can do whatever they want, within the loose confines of the law to which it applies to the rich and powerful. It is up to the people to decide for themselves if they will tolerate this dynamic - either because it benefits them, or they don't care to change it. Assuming people do care about ethical behavior, the options for recourse are fairly limited. There is the law, which is often applied unequally, and there is individual actions that add up (collective action). I'm going to assume the only thing that we can do as ordinary people is collective action, and with collective action, we can try to put pressure on the individuals who enforce the laws. 1.) Vote for people who will write those laws. There you go. Find people who agree with you on a perceived injustice and convince them to act. That's really all people can do. I suggest starting with the big issues, the issues that undermine the process of righting wrongs - such as money in politics. Money in politics makes it so that the people who can afford to have their voice heard, get their voice heard. To anyone not in the 0.0001% of wealth, this should be a no-brainer. It fundamentally undermines the values of a Democracy, where instead of the intrinsic value you have as a person, the intrinsic value is how much you can put in the pockets of lawmakers. What I get out of this is that there is something wrong with Google's culture and a company that powerful with that sick a culture needs to be dealt with by anti-trust laws. Think about it. Can anyone imagine a Microsoft or Apple employee using their products or services to try to hurt people they don't like because of their politics? I have friends at Microsoft and they were always very paranoid about doing anything that could be interpreted as an abuse of their power because the DOJ was breathing down their necks. 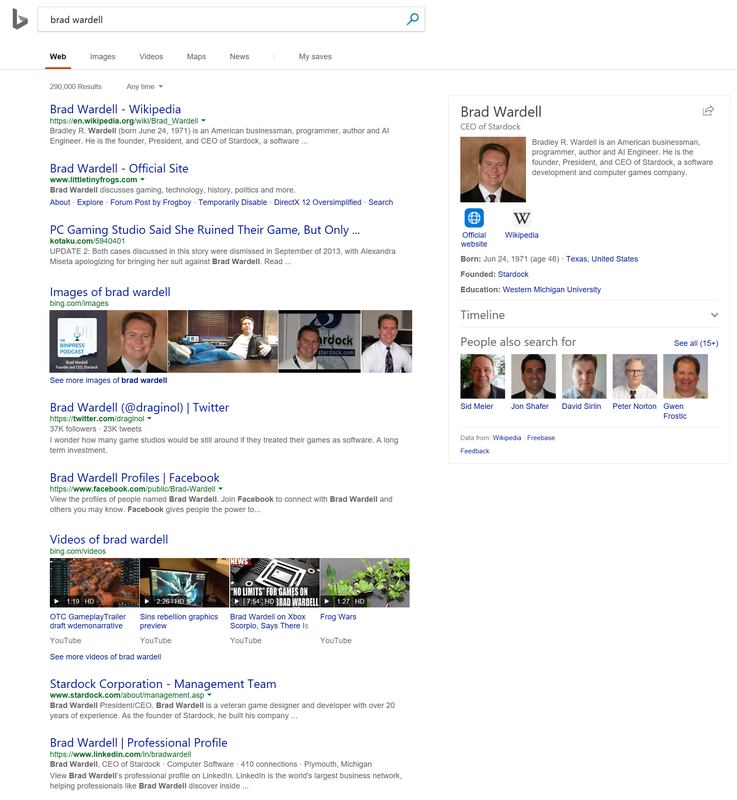 Do I think this guy manipulated the Google search results? Yes but it doesn't matter because the worrisome aspect is that he feels safe to post such a hateful article in the first place while advertising he is a Google employee on the Chrome team. Guys like him are a dime a dozen but reputable companies don't usually hire them and if they do, they don't tolerate them abusing their position. I recently changed my default search engine to DuckDuckGo this week, and 3 years ago I moved my email domain off gmail. The email domain wasn't because of what they're doing now, but rather because of Google Reader, and what that told me about the company's priorities. I decided I didn't want to keep all my eggs in the Google basket, and I wanted to have my email in a place where I'm the customer, and not the product. Of course, I still have 3 different email addresses on Gmail. One for work, and 2 personal addresses, but those are lesser used ones for when sites don't like my 4 custom domains. In our case, Google wanted to license some of our tech for a project they're working on. We chose to license it to Microsoft instead. It's not that I would refuse to do business with Google but rather Google has lost a lot of good will with me. I just don't trust them anymore after the Damore thing when combined with the vile Tab Atkins behavior. I never did! Something about that company never sat right with me and I resisted using its products and services for years. Unfortunately, with its talons into just about everything these days, Google is nigh impossible to avoid. It's much harder to take on Google as an antitrust case, because they were seed funded by the CIA. 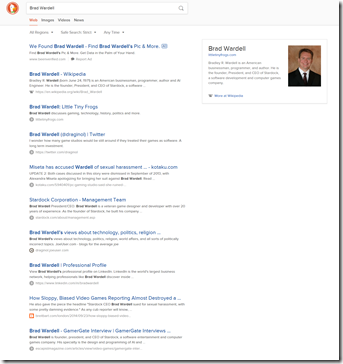 Who investigates antitrust matters? The Executive branch. Who seed funded Google? The Executive branch. OTOH, there is an Achilles heel: the EU. They are more about antitrust than the US. Especially when it's US companies involved. An Achilles heel yes, but only to a point. Decisions on anti-trust, etc, will affect EU members only and aren't global, which is why major US tech companies aren't going to change anything domestically... or for countries with little to no bargaining power. In other words, it's business as usual. There was a time when the customer was always right. Nowadays the customer is irrelevant. The Damon thing is what finally got me to sell off my Google stock. Not out of a sign of protest but because I fundamentally don't have confidence that a company that is so insular in their politics is capable of doing real innovation. 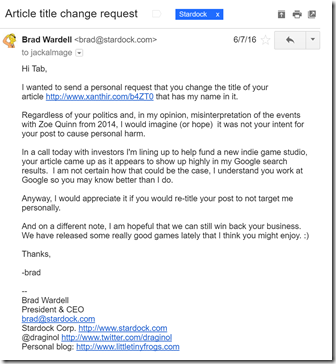 If a Stardock employee did what Tab Atkins did, they'd get fired because we don't want a company culture that has such naked malice towards other people. If I were as bad as he thought, I would have already obliterated him with the lawyers. But unlike him and the general Google culture, it seems, I can tolerate other points of view. Exactly why Government needs to regulate Google, Facebook, Twitter, etc. Google should be forced to hand over its search engine to competitors via anti-trust law. Use anti-trust laws to break them up. Give facebook's source code to several startup competitors and allow free profile movement between them and interlinked connectivity between the companies. Everyone would still be connected through the Facebook platform but would not be controlled or governed by any one company. AT&T was broken into smaller companies and their infrastructure allowed to be used by competitors, so the same concept can be used by precedent against social media. You may have sprint and I have AT&T but we still use the same phone line to call each other. Same concept for Facebook. I have company A, you have company B, but we still see each other's profiles, posts and can message each other.